Click on NOTE CATEGORIES to browse by topic, read through the entire archives, or type a topic in the search box. This post was updated January 2019 for light editing and to link to new posts of similar content. Enjoy and go outside and move! Let's face it, kids are rarely excited to "go for a walk," especially at the frequency adults like to take one. And, part of this is probably very natural. Walking is fairly mundane when you can't see the benefits in real time. In more natural times, walking was not done for the sake of walking, but for survival. Walking was also the "classroom" that provided children with the necessary environment to learn survival skills—play, identifying plants, foods, and danger. Since I love walking outdoors and I know children need this movement as an environment for robust development, I came up with a game of sorts, a scavenger hunt that keeps the kids out of "walk" mode and in "scavenger" mode. Items on the scavenger hunt list are "find its," "hear its," and "do its." "Find its" include: Spiders, slugs, flowers, new growth, berries, webs, other people, dogs, moss...whatever is local to your area and the season. "Hear its" include: Airplanes, bird song, farts, leaf blowers, water moving, fog horns (yes, we have one! ), and again, whatever is local to your area. "Do its" include: Walking a log, swinging from a branch, running backwards, climbing a hill, running down a hill, pick up trash, peeing outside, POOPING outside (bonus points), a bit of barefoot walking, resting, drinking water, and whatever else you can come up with. Here's a game sheet to make this game easier for you and we've left blanks for you to fill in with unique items to keep the game fresh/make it pertain to your area. We also realized that an urban walking scavenger hunt is also needed. We'll do this the next time we head to the city! 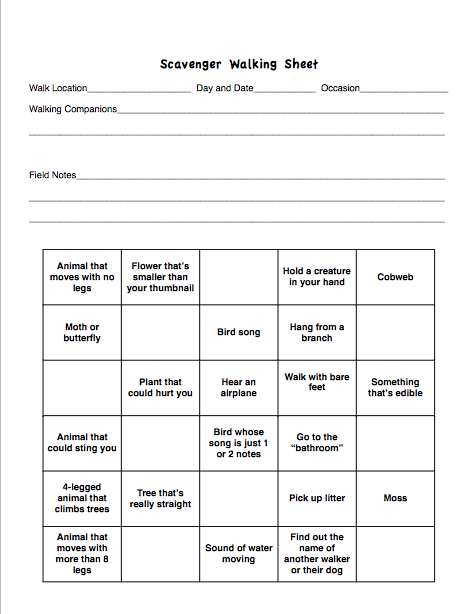 Download the scavenger walking sheet. HINT: Spending time with the same few people day after day is fairly unnatural. Kids prefer a herd and can benefit from the interaction with kids of varying ages. We always try to take "extra kids" with us whenever we go out walking, which is almost every day. This not only makes walking easier for us (the adults), but it can serve as a relief for our friends and family with little ones. #vitaminCOMMUNITY! Find more outside/moving in nature games and ideas at A Moving in Nature Game and Come to Outdoor School for Five Minutes. Ready to learn how movement can change your life? Sign up for our emails, packed with moves, news, and tools to build your own movement community. You can look forward to education, information, support, events, discounts and more!